With summer round the corner people are set to go places and have a nice and memorable vacation. While people look out for different new adventures, they often end up disappointed with the services they get and when their holiday turns out to be something different than they imagined. Let’s take camping for example. Camping is not everyone’s cup of tea. May people may like the idea but when they actually go for it, they may face difficulties when it comes to tackling with mosquitoes, being in the wild, and unavailability of other amenities. 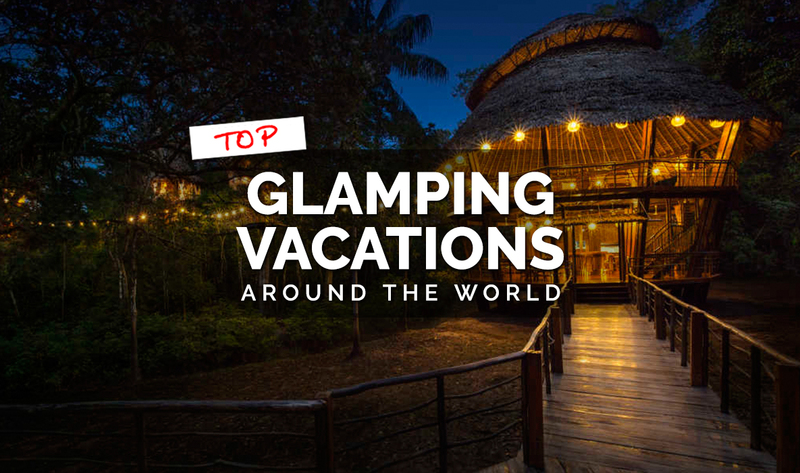 But for those who really want to experience camping, with all amenities and have a lot of money to spend, Glamping is the perfect experience you can venture into. Here is the official definition of Glamping: Glamping (noun) an abbreviation of ‘glamorous camping’; glamping involves all the luxuries of home. ‘Glampers’ stay in yurts, tipis or luxury caravans, instead of basic tents.- Macmillan Dictionary . The kind of things glampers can expect are electrical power, lighting, comfortable beds, even private washrooms and hot tubs outside. By giving these amenities, glamping has opened up the outdoors experience to the people that have been disappointed with the idea of camping as of recently. So if you relate with the mainstream, why not give this “glamorous camping” a chance ? 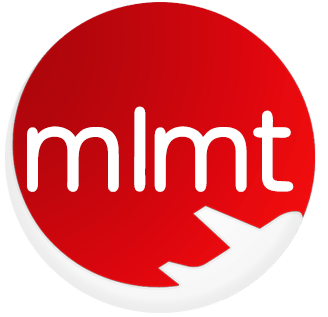 Here’s MLMT presenting a list of destinations where you can go to experience Glamping and make memories that all last a lifetime. 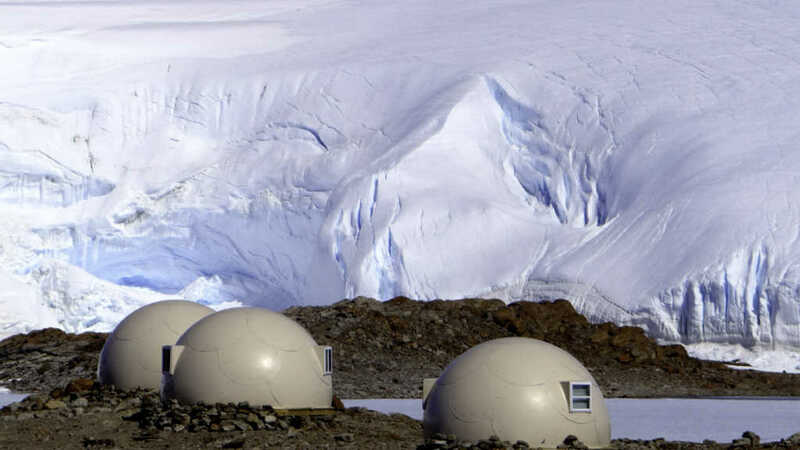 This remote “glamping” site in Antarctica includes a line of igloo-like fenced areas fitted with upscale decor like fur-chairs and bamboo headboards. Whichaway camp is one of a kind, being in the remote area and providing modern amenities. 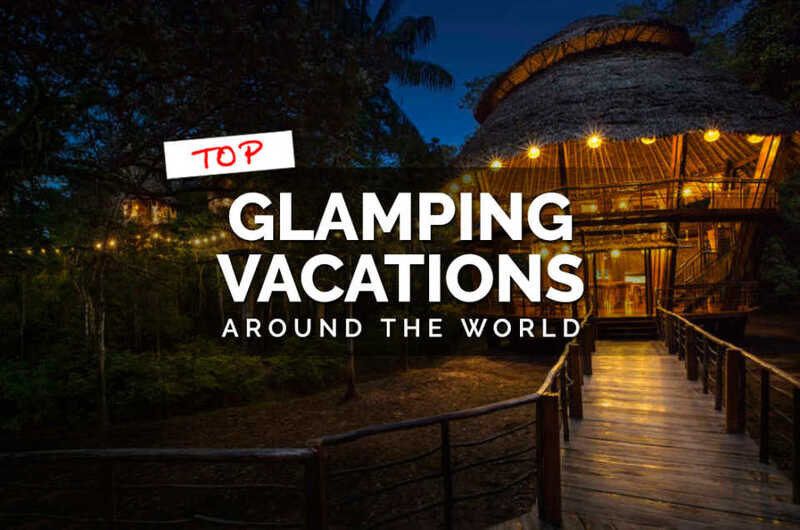 The camp gives six best dome shaped pods intended for extreme privacy, which include an a la mode mix of old world African safari theme and modern day amenities. To do list would include and range from gentle hikes and treks to ice caves and relaxed picnics on a glacier to ice climbing and kite skiing. Another thing that is surely special to this Antarctica experience is the chance to see 6,000 Emperor penguins walking together in their natural surroundings. Sounds fun? 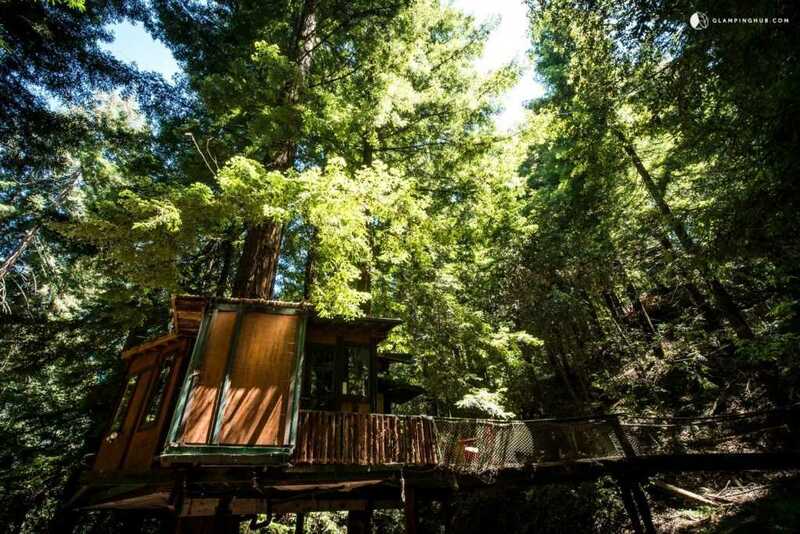 Whether you like hiking in the old redwood woods or like to appreciate beaches, Glamping tree house in California is the spot to be. The tree house is planned and equipped in such a way that it can accommodate up to four visitors. It has a comfortable, queen size bed to fit atleast two visitors. Two tri-fold shikibuton sets and two camping beds are also available for extra visitors. There is a kitchen with a little stove, a refrigerator, vessels, and basic kitchen staples. A hot tub is also available for guests. And guess what there is an extra cute cat waiting for your arrival named Grey. Want to meet it? 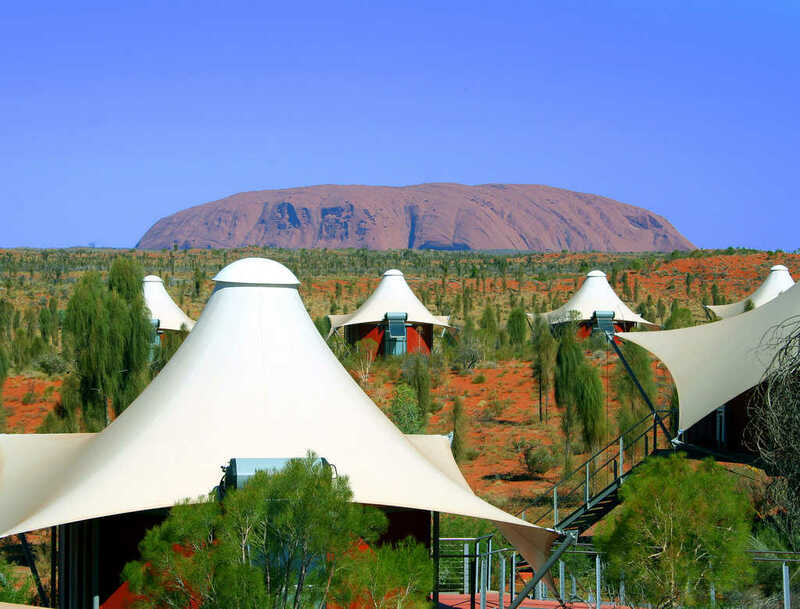 Uluru has been present in Australia for hundred millions years now but it seems to look different every minute you look at it. It is said that the best way to appreciate the ever changing beauty is from Longitude 131º, which is a line up of extravagant pavilions settled in the red rustic scenic landscape. The insides of these pavilions are sumptuous: from the humongous bed to the array of windows , everything is intricate and has a lot of small details which makes them the beauty they are. Visitors are guided on a schedule of itineraries permitting a private experience with the district’s iconic attractions. You can indulge in some home-made snacks and enjoy great coffee too. All these add up to an experience of glamping you won’t ever forget. Enticing enough? 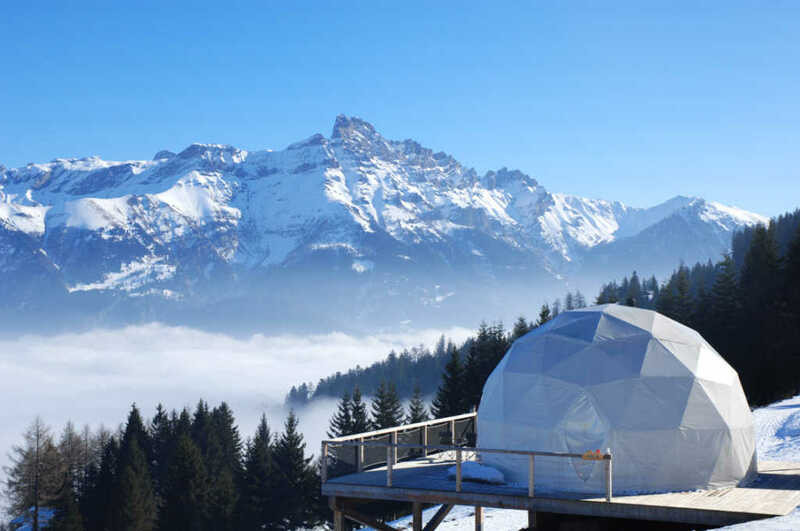 When it comes to glamping, Whitepod offers the best ways of enjoying the Alps wherein you get to see and experience 15 dome shaped structures pitched on wooden stages. Each unit is shielded from the cold and snow, outfitted with a wood-burning stove, organic extravagant bedding and bathroom. Whitepod helps experience glamping the best in Switzerland. The philosophy of Whitepod is everything which is in favour of nature and limits the negative effects of any misconduct on Earth. This is felt all through from their choice of using local items and providers. There are plenty of hikes and activities such as dog-karting and paragliding throughout the year and a private ski slope only available to Whitepod’s guests for the winter. There’s also a selection of massages to choose from. Why not unwind in style? In the event that you don’t find tent lodging lavish, you’ll be in for a pleasant surprise at The Serai. 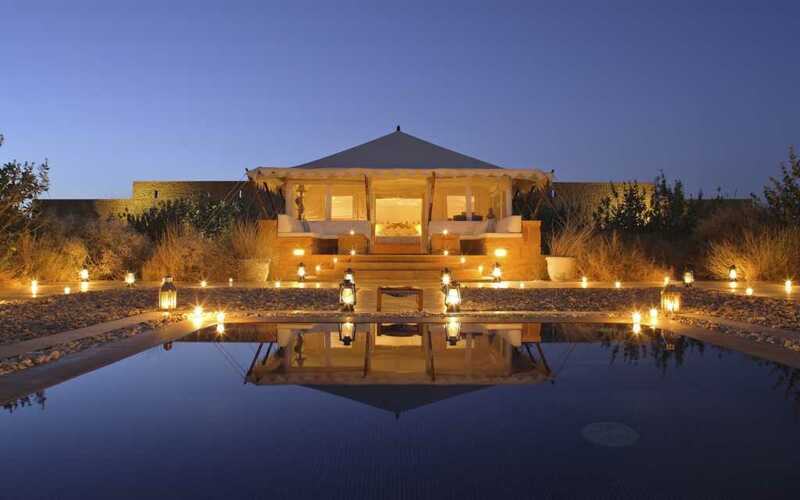 Comprising of 21 huge canvas tents based on a base of Jaisalmer stone, The Serai is spread to thirty acres of land of the desert in the Great Thar Desert. Each offering everyone the amenities one would expect at a luxurious hotel and not in a tent, including a private veranda, living area, extensive air conditioned rooms and dazzling en-suite washroom. The Royal Suite comes with a private spa, outdoor pool, and dining and lounge tents.​ The best part is that many tents even have their very own private Jacuzzi for a definitive in extravagant desert living experience. 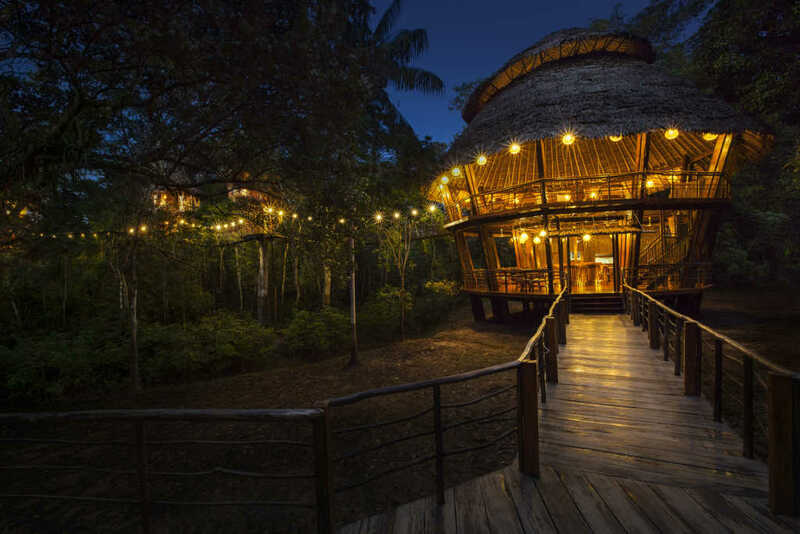 Treehouse Lodge located near Pacaya Samiria reserve, in the Peruvian Amazon Forest is an all inclusive, luxury eco-hotel/lodge which is first of its kind because its nearing 100% sustainability. Cool isn’t it? It has eco-friendly disposal of waste, purification of river water for daily usage, and solar power to sustain in a responsible way. Every morning the guests wake up to a colourful view of exotic birds and chaotic monkeys prancing here and there while they are still rested on their comfortable beds atop their treehouse that defy gravity by all means. Each house is connected to the other with suspension bridges as high as 70 feet and each well equipped with bathrooms, comfortable beds. and electricity. Activities to do include animal interaction, canoeing, safari, yoga, kayaking, bird watching, farmers market, fishing and sunrise/sunset cruises. Sandat glamping allows its guests glorious days and nights away from the hustle and bustle of Ubud Town. There’s a sense of calm and tranquility that greets you and surrounds as soon as you enter. There are eight rooms to choose from, fully furnished with a bed, wardrobe, lounge chairs, bathrooms and lamps. Most of the tents and lumbungs are extremely private and completely air-conditioned. The interiors is a mix of Italian touch with Balinese furnitures. Sandat has accomplished a great deal of settling each tent among nature; each tent appears as though it has been always there, with enormous plants cautiously positioned around them. Activities whilst in Sandat Glamping, yoga classes, massages, rafting, and trekking. Guests can also swim, get massages, and have delicious food. Why settle for less while camping than getting more while glamping, inclusive of all amenities to provide the guests utmost comfort and adventure at the same time. Why settle for a five star hotel when you can lay down under a five billion star laded lodge? Ready to have the experience of a lifetime? Glamp instead of camp!